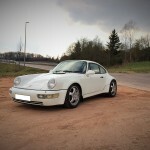 Porsche 964 Carrera 4 Turbolook ex factory in a rare white/grey color combination. 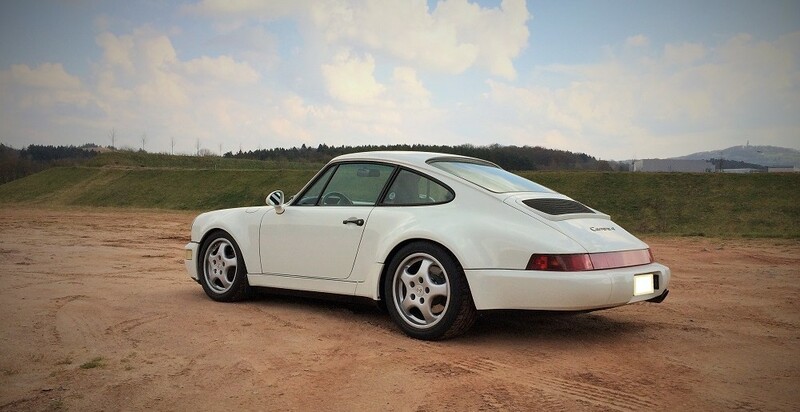 Apart from the well known 964 Jubilee, Porsche did offer the Turbolook as an option for the American Market in 1993. These models are quite rare (267 cars) and wear mostly a more classic color like black, red, silver or white. The car on offer was first registered in 1993 and was imported 2010 to Germany. The change of the speedometer was done and is certified in the servicebook. This wonderful example is in pristine condition and is only showing 88.000 km. The condition is outstanding with 90% original paint and the car is free from any scratches and dents. The car was never involved in an accident. 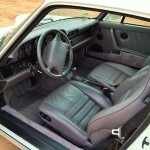 The interior is very clean and in almost perfect condition. The car has original CUP rims, a CUP tube for better sound and an adjustable Bilstein B16PSS10 suspension. A big service was done recently and the car performs flawlessly. Price on request.